AM: 9th street to Heritage Trail south to Happy Hollow Park and back - 11 miles, averaged 8:09. I checked the first mile when I got back. 10 minutes with slight downhill. Has me rethinking workout Wednesday, moving it to Thursday. Ran the last 4-5 miles in the 7:20-7:30 range so I would get back by my imposed 9:00AM deadline. PM: 4.25 miles, averaged 8:11. Did some strides. Thinking some sleep and a lighter day tomorrow and 3 x 2 miles for Thursday morning. Or 10 x 1000. Feel like I need to get some longer reps in the 1:15 half range so high-1:15 to mid 1:16 feels "easy." AM: North side - 4 miles, averaged 8:02. Did some strides. PM: North side 7.75 miles, averaged 7:32. Angry running. Had a car slow down and some folks harass me, so I told them what a piece of crap they were when I chased them to their house. Had someone else make a comment, so I gave her a nice nickname as well. To top it all off, I thought I ran 4.25 miles this morning, but should have run 8 this afternoon to make an even 12. What luck! AM: Pretty spectacular fail for this morning's workout. Goal was 3 x 2 miles as close to "ideal lactate threshold" as possible, meaning a pace based on a recent race with adequate rest, which is about 5:50 or 5:51 for me. A little ambitious. So I figured 5:55 would be okay. 5:58 for the first mile, then things just got bad and I could barely run 6:30 and I was doubled over sucking air and dizzy when I cut the workout (very) short. About 68 degrees with saturated air. This is not an excuse, but it should have been an indication that I should have gone with a more sensible 6:10ish goal and see what happened from there. Trying to do to much, trying to push, push, push and I think it may have caught up to me. Or something else could be going on. Still plan to cut back this week. I'm just glad my arrogance was punished by a frustrating workout and not an injury. Afternoon off. Headed to Toledo for Megan's bother's wedding. Might run tomorrow, might not. Approaching 60 days and very few have been easy. Lots of racing and weekly mileage PRs. In Toledo for Megan's brother's wedding. 6.25 miles, 5.5 with Megan. Did some strides. Averaged 8:50 I think. My legs feel like bricks. Megan will be busy all morning tomorrow, so I'm going to hit the trail and see if I can get something over 2 hours at pace that will be determined by feel. Best of luck to all those running St. George. I have some predicted times, which have been time-stamped on my iPhone. University of Toledo campus and trail - 16 miles, averaged 7:30. Changed my plans of hitting another trail because I couldn't get around the parade. Misty, and not really an enjoyable run, but I got in 2 hours on my feet and kept the pace as honest as I could for how I was feeling. I was a bit off on my predictions, but I did okay. Lesson of the day: never underestimate Fritz. I thought 2:23 given his rebuilding months. Boy, was I wrong. Amazing stuff. Congrats to all. Off to Megan's brother's wedding. I'll try not to drink and eat much more than I already did this weekend. I was overdue for a day off. 58 days on. Not my longest streak, but one of my most successful and consistent high mileage: 86, 93.5, 94.25, 93, 71 (Philly RnR), 89, 95+, 84.25. My legs felt heavy on my run with Megan and my long run yesterday. Today they were crappy (I blame my wedding gin and tonic PR). I expect to work things out this week, maybe staying in the 80s before 2 "huge" weeks leading into Indy. See what the body gives me, run hard on Nov 2, then go into maintenance mode for at least a few weeks before working on my Boston buildup. I'm slowly working through the race reports. Crazy stuff. The quality of running is amazing out there, but the quality of the races of those coming off pretty major injuries (Fritz, Matt, Ben) are just insane. Lots of great times. Taking Rob's suggestion here. 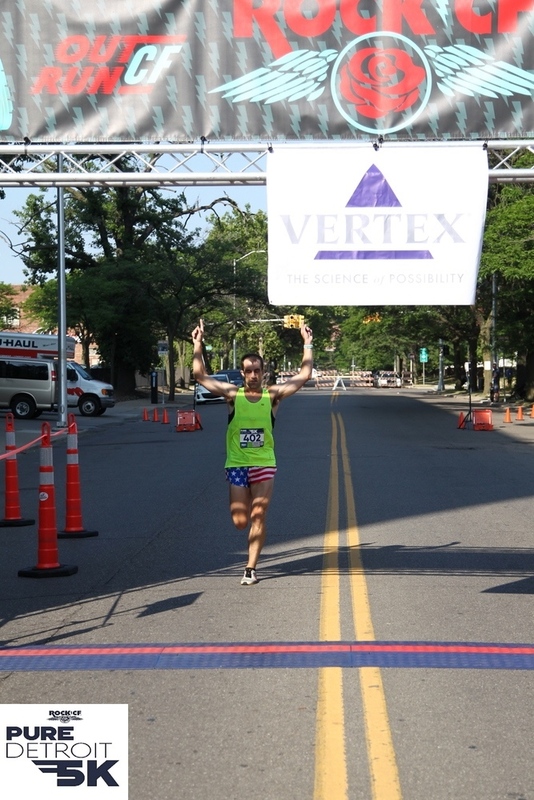 Take a look at Wesley Hunt's 100 miler report here. It may get missed among all the other fantastic reports. PM: North side - 6.5 miles, averaged 7:48. A couple strides. One school-to-school @ 4:38 pace. Beautiful fall weather today. AM: A Take-that!-last-Thursday-failed-workout! AEROBIC BUILDER. 13 miles, averaged 6:57 w/ 8-mile AT tempo in 51:12 (6:24 average): 6:29, 6:31, 6:27, 6:28, 6:25, 6:22, 6:16, 6:14. 3 up and 2 down. More of a fast finish than a progression. I was working a bit, but that's okay. I was flinging fluids a bit (usually a sign I am not at all relaxed), so as long as the blog style police weren't in the bushes I think I'll be okay. Did a few loops on the .5 mile portion then headed out for the longer loop, but the road was closed, so I had to get creative. AM: Off. Had some academic work that needed to get done. PM: Spring Vale Cemetery - 10.25 miles, averaged 8:19. Stopped by Tri-N-Run on the way home from to use my gift certificate to get new compression socks to replace the one I lost. Went with CEP recovery. My others were CEP run, and they were great. I think my legs are bigger (just over 16" up from maybe 15 or 15.25 when I bought my first pair). AM: 7 x 1 Mile @ LT: 5:55, 6:03, 6:00, 5:58, 5:58, 5:57, 5:55 (5:58 average). 2 Minute recovery jogs (8:15-9:30 pace). Warmed up 4 with a half mile at MP, a few quick stretches, and two pace strides. Had to navigate some work trucks, but we reached a silent understanding I think. I thought I would be much faster, closer to my calculated LT pace of 5:50, but I guess I am entering the territory where you can't just knock out mile repeats 10 seconds below HMP. I just couldn't get my legs to turn over. My breathing was quite good. No extension in my hips. I feel pretty good about the workout. 3.5 down. A little over 16 total. Going to hit the 3000 mile mark this afternoon. Ran in my new flats. I really needed new shoes as you can tell :) They were my present to myself for my A++ goal at Philly and I had some credit at the local running store and some extra coin from an extra copy editing job I picked up. Some nice improvement over the MV2, but not quite as firm. The heel counter is much more flexible and the inside is even better sockless (as I prefer). The sole on the midfoot has more surface area, which makes it a better marathon shoe. Finally, my size 12 was 6.5 oz, and my former flats were 7.2 oz. Pretty decent when you can knock out 16 miles in a brand new, out of the box, pair of shoes sockless and not get any hot spots. PM: Rest Haven Cemetery - 4.5 miles, averaged 8:27. "Jason what was the first thing you did when you hit the 3000-mile mark? Well, thought about how much a hate the people in this town. Then I had a banana and a very rare post-run beer." Weather looks pretty good for the Chicago Marathon tomorrow. Just looked over my notes and I hit the 2000 mile mark last year on Oct. 18, so I am easily 1100 miles up over last year at the same time. I've improved a lot, but I've also run a lot more and especially this fall, done a lot more quality (15-18% or more, most weeks). AM/Lunch: Spring Vale Cemetery - 10.5 miles, averaged 7:56. Beautiful fall day. AM: Firecracker loop w/ modified wick - 11 miles, averaged 7:47. Did some strides. Skipped the AM because I had to do some academic work. I hate when that happens. 13.25 miles, averaged 7:03 w/ Aerobic Builder: 7-Mile AT Tempo over slight rolling hills in 44:48 (6:26 average): 6:28, 6:30, 6:28, 6:29, 6:26, 6:24, 6:17. 3 up, 3.25 down. Not sure why I never do workouts in this park (Murdock). Just under a mile around the perimeter, two bathrooms and fountains. I guess I worried about the downhill, which are short but somewhat steep (enough that I have to work a bit to keep my feet under me). Uphills are likewise short, but they force me to slow down and change my form (which is what I was looking for). Could have gone 8 or 9, but with a race this weekend, and no idea what recovery will be like tomorrow (no shakeout run, up and down hills) 7 was probably more than plenty. Pleased with this one. AM: Off. Work to be done, but I have a race Saturday anyway and I am gunning pretty hard for my first 100-mile week without stretching it too much the next 3 days. On the academic side of things, I decided to postpone the job search, which has me relieved as it allows me to focus on finishing my work in a quality fashion. Should stop me from stress eating, which I have been doing lately, which accounts for the weight that hasn't gone anywhere despite running 89 miles per week for the last 9 weeks. 200s into the fall air this afternnoon to stretch the legs. PM: 8 miles w/ 8 x 200 in 37.6. Slower than I wanted, but these were about +10 meters (.13 on the Garmin), so my goal of 35-36 was probably not far off. Wanted to run about 4:45-4:50 pace, but mostly to stretch the legs out. That's where I was. AM: 4 miles easy, averaged 8:25. Did some pace strides up and down hills as I encountered them. Legs are tired, but the first mile today suggested they are still breathing. 9:15 as usual and I tried to crawl as much as possible. PM: Rest Haven - 4 miles, averaged 8:13. Did a few paces strides. Felt ok.
AM: Boilermaker Half. Missed my sub-1:20 goal, but this was a workout at the end of my biggest week ever and if I said I was disappointed I'd also have to consider myself foolish. Rainy and 42. My first race of perhaps 30 or so that it has rained (Beach to Beacon had a passing shower this summer). This is the second year of the race and the 3rd revision to the course, but I double checked to make sure it was still certified. Indeed it is. Timex it is. I wanted to run about 6:00 minute pace on the flats and work the hills by effort, finishing 1:18:30-1:20. I was running close to 6 flat for the first 6 or 7 miles, then the uphills started and I lost some time, which was to be expected. My real goal was to finish in the top 10. I was 9th for the first two miles (we were packed up, which was super fun), and a few guys fell off around mile 4 and I moved into 5 for most of the race, passing a young fellow at mile 12 to break into 4th (a top 3 finish would have required 1:18 something). I felt like I raced according to effort today, and kept it honest. I was pretty tired from mile 7 on, but I didn't feel completely dead-legged in the final 1-2 miles (just heavy). On a flat course I'm not sure how much faster my time would have been. The real goal is in two weeks anyway, so that is were I am looking. With 50-60 miles in my legs rather than 80 and a dead flat course, I expect a decent PR (of course not as big as the last jump). 2.25 up and 3 down. I started to bonk and get dizzy on the cool down (I decided to run without a gel for the first time in a half, took no water given that it was coming from the sky and it was cool). So . . . things I consumed while running my cool down: large cup of Gatorade recovery, a granola bar maybe 2, a banana, some rice cakes, 2-3 packages of fancy graham cracker things. Some other crap too I think. I felt better after that. Good practice for potential, future ultras too. Rich, chocolatey goodness: 5:59, 6:03, 6:14, 6:00, 5:47 (quite downhill), 6:08 (slight hill toward the end) 6:04, 6:13, 6:22, 6:16, 6:11, 6:30 (hills), 6:02, ~33 seconds for the partial. It's a .1 steepish downhill, which I both love and hate. About mile 8 I heard a young woman say what sounded like "they went out too fast." I almost gave her a Mr. Murphy lecture on being a good volunteer but I figured if I stopped I would roll back down the hill from campus into the Wabash river. PM: 4.25 in the cemetery in just under 35 minutes. My first 100-mile week! A PR in mileage by 5 or 6 miles I think. Maybe another one next week, but it's hard to tell. Definitely something into the 90s, a number that has served me quite well over the last 9-10 weeks. Why do we lose good running form? See knee drive on #3. AM (for 90% of the run at least): 10 miles, averaged 8:07. Felt pretty good. Tried to hit some soft surfaces without looping into insanity. Probably some time running in circles on the grass this afternoon. Had some leftover smoked salmon recovery sushi for recovery. I could eat that every day, but I couldn't afford it. PM: Vinton Elementery grass loops - 5.25 miles, averaged 8:13. Some kid said, "Stop spitting, jerk." Then the other one said something about getting paid. All right, fair enough. Spitting is a dirty habit. But don't call people names. And don't talk to strangers. AM: Spring Vale Cemetery et etc - 11 miles, averaged 8:00. Did some strides. Some cold mornings coming up this week. AM: Jefferson High School (long) - 10 miles, averaged 7:44. 27 degrees and sunny. Usually I groan for 20 minutes on the first freezing day, but I felt very good on this run and I was comfortable in my tuke, gloves, and baselayer. About 10 degrees colder than the then-coldest run a week or so ago. Couldn't decide what to do for workouts this week. I was going to do a v02 max workout and a big HMP workout, but I don't think the v02 max will help at this point, so I will do a set of 200s and sprinkle in some strides to keep things stretched out. As for the HMP workout, I usually do the Hansons', which has served me well. I open to suggestions. PM: North side - 6 miles, averaged 8:12. Did some strides. AM: Final Indy Workout: 3 x 2.5 miles @ LT-HMP w/ ~3:15 recovery jogs: Repeat 1: 14:56 (5:55, 6:03, 2:58) 5:58 average. Repeat 2: 15:08 (6:06, 6:03, 2:58) 6:03 average. Repeat 3 15:17 (6:08, 6:09, 2:59) average 6:07. 6:03 overall average for the 7.5 miles. Recoveries were right at or just below 9 minutes. 4 up and 3.5 down. This was a tough workout. I wanted to tweak the Hanson Brothers' I usually do to make it harder and I got what I asked for. The final half mile left me gasping for air. I think I need a loop with fewer than 8 90-degree turns per mile. Overall, this was not a bad workout. I wanted to be closer to the average of that first mile, but that's okay; I couldn't push much harder than I did and still finish the workout. Given the half on Saturday and 10-11/5-6 doubles the last three days this is probably a better performance than I think. PM: Rest Haven - 4 miles, averaged 9:08. Kept it very slow. I got to campus and my stomach decided to trounce me pretty bad. Came home, took a nap and felt better. PM: Firecracker loop - 10.25 miles, averaged about 8:00. My Garmin messed up and corrected for where it assumed I went I think. Did some strides. Nice to see some lower 4s flashing while remaining in control. Did some brief HMP pickups for a few stretches during the run. Hip flexor area was a bit off during the week, but not painful. I got up this morning and could barely walk. No power or stability. Rut ro, Raggy. Another day off. Better, but not runable. Lots of ice, stretching, and compression. Starting to think that 3-4 days off will be fine if I can run by Tuesday, Wednesday at the latest. Leg not much better. Friday I scheduled a massage for Tuesday. Tried to jump rope and do some very easy jogging in the driveway. No stability in mid stance. No knee drive forward. Had a massage. Felt good. Tightness in hips and plantar facia. Had Rachel work the hip area and stretch. Little limping on the way home. Jason was a smart guy and had two beers after (and several Skyping with a friend). Bad idea without flushing the toxins released from the massage. Pretty serious depression the last few days. Rough day. Felt awful. Leg was okay. But my body just felt terrible. Sick without the sickness. Racing is clearly not in the plan. I'm still going to the race, since I've paid for a hotel and I should pick up my shirt. I'm glad so many bloggers will be there. It means a lot to me to watch them race. Made an appointment at the health clinic on campus. If the trainer tells me to stretch and ice, we are going to have problems. The last time they told me I didn't have an You too. Thanks. because I couldn't locate the exact moment of the injury. If that's how the profession understands injury it clearly needs some serious theoretical reconceptualization.